Gwendolyn Terry’s Murmuration was named among Artprize 2014’s Top 25 finalists in the public vote for the Installation category at ArtPrize 2014. The first batch of category finalists in the public vote were announced Sunday, September 28. 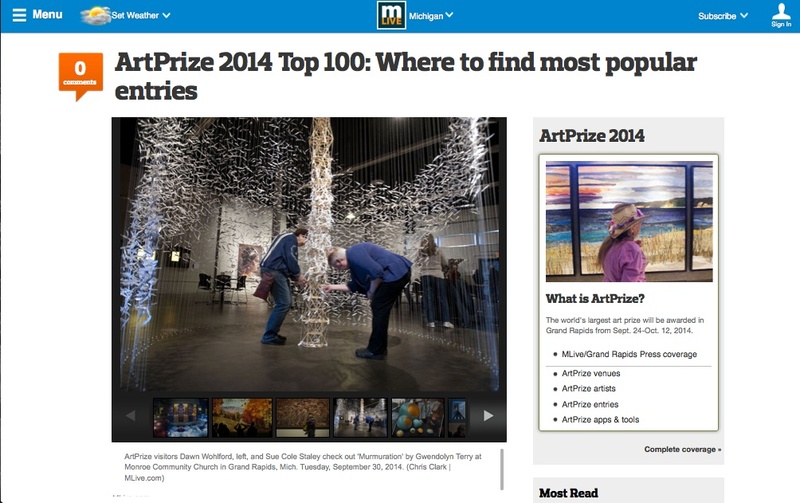 As of Wednesday morning (October 1st), more than 200,000 people have voted in Artprize 2014. On Sunday, October 5, the Top 5 category finalists will be announced. You can see Murmuration in the gallery space at Monroe Community Church, 800 Monroe NW in Grand Rapids, MI Mon-Thurs (12:00 pm-8:00 pm), Friday & Saturday (12:00 pm-10:00 pm), and Sunday (12:00 pm-6:00 pm).